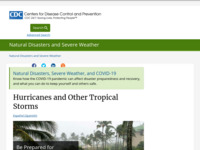 The Centers of Disease Control and Prevention created this website to inform citizens about the health and safety issues related to hurricanes and other tropical storms. The website includes an information spotlight discussing especially important health related information such as mold prevention. Also included are hurricane recovery links and information for specific interest groups such as schools, pet sitters, volunteers and evacuees. Users may also follow links to other general information regarding hurricane preparedness, flood recovery and weekly mortality and morbidity reports.